Breckenridge gives good snow. That’s one reason that skiers love this high-elevation Colorado town. The town of Breck, as it’s called for short, is perched at 9,600 feet above sea level. Even though it’s closer to Denver than many other ski towns (only about an hour and a half drive up Interstate 70, if traffic is cooperating), it is a higher altitude than most other ski resorts in the state. Arapahoe Basin, surpassing 13,000 feet, is the highest elevation ski town not only in Colorado but also in the United States. Breckenridge’s slopes don’t fall much behind that; its top elevation hits 12,998 feet. Because of this, Breckenridge sees a lot of snow: 353 inches on average per year. Its ski season is nice and long, from November to April. 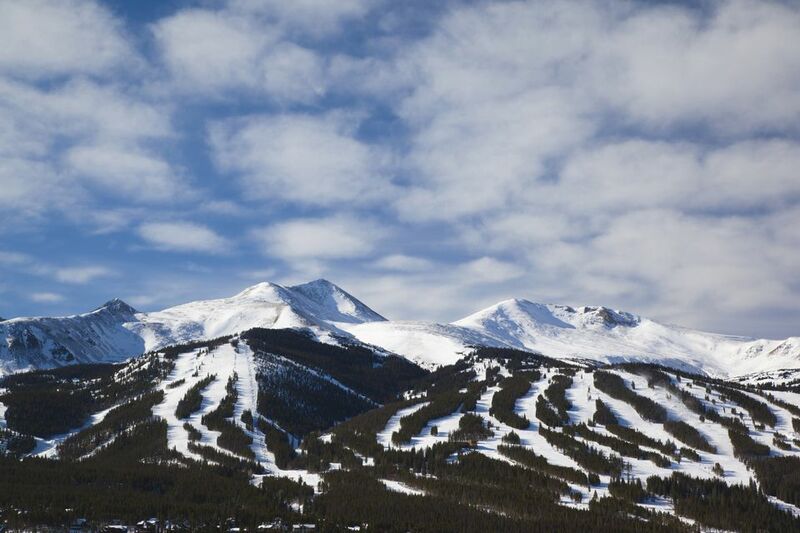 Yup, you can ski here over spring break, and that’s one of Breckenridge’s claims to fame. You can look for spring break beer festivals every year that draw in big crowds. Not to mention Breck boasts 2,908 skiable acres and 187 trails on five different peaks. There are so many reasons to visit Breckenridge, beyond skiing. It's charming, Victorian, colorful downtown. Tons of cool festivals. Jaw-dropping views of the Tenmile mountain range. But if you’re headed to Breck for the powder, here’s what you need to know. Breckenridge, just west of the Continental Divide, is an old mining town, first founded in 1859 after gold was found here. You can still see reminders of its past as you stroll throughout town. Another Breckenridge claim to fame: It’s the oldest continuously occupied town on the western slope. As a ski town, Breckenridge is one of the most visited in Colorado and in the western hemisphere. It opened its slopes in 1961. It is operated by Vail Resorts, which runs a handful of other ski resorts in Colorado, including Vail Mountain. Breckenridge has 2,908 skiable acres; 3,398-foot vertical drop; 11% beginner, 31% intermediate, 58% expert/advanced. Breckenridge stretches across five mountain peaks on Tenmile Range. It offers terrain for all levels. Here is a look at some of the terrain options. Note: Don’t forget about Breckenridge’s cross-country options. You can get the full scoop at the Nordic center. Advanced: Most of Breckenridge is for advanced/expert skiers. You will find black and double black trails on Peak 10; the double black North Chutes on Peak 9; and black bowls on Peak 8. In fact, these are some of the country’s top terrain parks. If you’re highly talented, experience some of the resort’s best powder on the Sixth Senses bowl on Peak 6. Intermediate: You will find blue runs on Peak 9. Peak 6 and 7 are also great for intermediate skiers. Peak 7 has seven runs that vary from gentle to more challenging. Many skiers love the Claimjumper on Peak 8. Beginner: The lower part of Peak 9 is a great learning slope. Check out Silverthorne, which the resort claims are one of the best trails to learn on in the western United States due to its vast open space. Also, check out lower Peak 8. Springmeier there is usually marked as family-friendly and slow. Adult tickets start at $147 per day. A child ticket is $96. A popular lift ticket choice is to get an Epic Pass that gets you to access to multiple different ski resorts for discounted rates. Breckenridge has a great downtown and lots of delicious places to eat and fun places to party. Here are a few of the many highlights. Giampietro Pizzeria: Giam’s is a local favorite. While this Italian joint specializes in amazing pizza, it has a lot more, including tasty salads, a full bar, and charcuterie, so you can have a cheese and meat platter with a glass of wine for a more sophisticated night out. The vibe is always exciting and a bit cozy. Expect to wait to get a table here. It seems everyone wants a slice of Giam's pie. Quandary Grill: This is nothing too fancy, but it has great views of the pond and filling burgers. Even street tacos and salmon in white wine sauce. It’s popular for apres. The casual atmosphere is oh so Colorado and the bar says packed in winter. Breckenridge’s microbreweries: Breck has several awesome microbreweries, including the lesser-known Broken Compass Brewing (which releases new flavors every Wednesday) and the well-known Breckenridge Brewery, with a full food menu. These two breweries have totally different vibes. We recommend visiting them both. At Broken Compass, snag an outdoor seat (and some photos) on chairs made out of old skis and an old lift chair. Breckenridge Distillery: This is a must-visit when you’re in Breck. It’s the world’s highest distillery. Warm up with Breckenridge Distillery’s spiced whiskey or other signature cocktails served on site. Take a free tour of the facility and try a little bit of everything. You get free tasters as part of the tour. (Note: If you like spirits, don’t miss the Breckenridge Craft Spirit Festival every fall.) You can also pick up some cool souvenirs in the gift shop and, of course, a bottle of your favorite spirit to take home. There are a handful of different places to rent your ski gear on the mountain and in town. Breckenridge offers skiing and snowboarding classes for visitors of all levels. There are family sessions, child lessons, adult lessons, and even women’s classes. Instructors are world-class and highly trained. Take a yoga class at the friendly and relaxed Meta Yoga Studios, a short walk from downtown. Visit the International Snow Sculpture Championships every winter and witness amazing blocks of snow hand-carved into elaborate sculptures. Take in the views on the highest chairlift in North America, the Imperial Express SuperChair. This lift takes you over 400 acres of mountain terrain with views of Quandry Peak, Keystone Resort, Lake Dillon and Baldy Mountain. Note: This activity does come with a bit of skiing at the end of it. The way down is an intermediate or advanced ski trail. Watch the Race of the Santas, which starts the holiday season in Breckenridge. Skiers wearing Santa suits race down the mountain to raise money for the Breckenridge Outdoor Education. Go shopping at the Handmade Holiday Market in the Breckenridge Arts District every holiday season. Celebrate the crazy Ullr Fest in January. For more than 50 years, Breck has paid honor to Ullr, the Norse god of snow, with snow dances, a parade, an ice plunge, the supposed world’s longest shot ski, ice skating, sledding, helmet decorating and more. Head over to nearby Frisco for a slower pace and visit the VIVE Float Studio. Here, you can experience float therapy to help your sore muscles recover from the slopes. Grand Lodge on Peak 7: Want to stay right in the action? You can actually stay on Peak 7 in the luxurious Grand Lodge. This high-end lodge has a variety of condo options, including places with full kitchens. There’s also a waterslide, three pools, a game room, a fitness area, and movie theaters. Good luck getting one of these rooms, though. Due to the location and luxury, these rooms book up well in advance and the owners of the timeshares (obviously) like to use them during peak season. Lodge at Breckenridge: This is another mountainside lodge that has amazing views. Suites come with a fireplace and kitchenette. Take the shuttle to town when you want to browse the shops and restaurants. Tiger Run Resort: Here’s an alternative, if you want a little more privacy and the feeling of being in the mountains. Tiger Run Resort, just six miles from Breck (between Breckenridge and Frisco) offers small log cabins with private decks, kitchens, living rooms and more. Request an upgraded cabin that overlooks the river and get away from the hustle of town. As a bonus, guests can even use the gym, tennis courts, indoor pool, and hot tubs, and there is a playground and fire pit to roast marshmallows around with your family. Tiger Run is an RV park, too, so if you’re rolling in on wheels, it’s a friendly and clean place to station. It’s definitely worth the drive into town. Plus, there is a bus stop off the main drag right outside the resort, so you can forfeit driving altogether. There’s free and ample parking at Tiger Run, not something you hear often in Breckenridge.